Enjoy a waterfront family-focused morning of maritime-inspired activities while learning about Florida’s fascinating history. 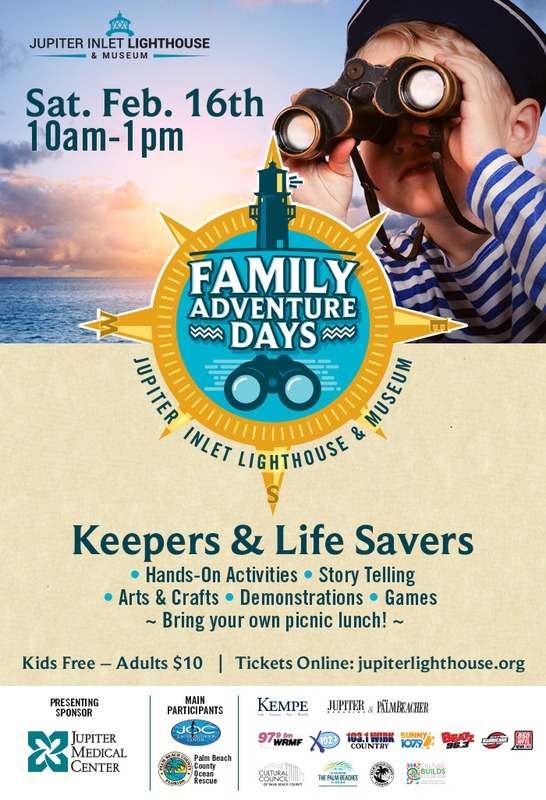 Jupiter’s “Keepers and Savers”–that’s lighthouse keepers and waterfront life savers–are the topic of the morning at the Jupiter Inlet Museum and Lighthouse. Organized activities include story-telling, arts & crafts projects, mural painting, cool games, water and rescue demonstrations by Palm Beach County Ocean Rescue and paddling activities by the Jupiter Outdoor Center. At noon, everyone takes a relaxing break to eat goodies from their own picnic baskets–so be sure to pack a light lunch and beverages, along with a blanket, sunscreen, hats and water shoes for some memorable shoreline relaxation! Although formal activities end at lunch, attendees are welcomed to tour the Lighthouse and grounds in the afternoon. Children must be at least 48″ tall to climb the Lighthouse, and all climbers must wear closed shoes–no sandals. After all, safety first! NOTE: Pets and alcohol are not permitted on the property. Tickets are required for this event. Tickets are free for children 18 & under, $10 per adult, and available here.